I am so intrigued by nutrition and how it affects us (and our families) now and how it will affect us in the future. There are many, many different philosophies, diets, debates, claims and studies that are contradictory in today’s society. Is meat great for us or will it cause heart disease? Are eggs a good source of protein or do we need to worry about cholesterol? Should we eat low fat or high, good fat? Is dairy good for us or does it make us sick? I’ve been learning some great things through my program at The Institute of Integrative Nutrition and I am excited to learn more and share with you all. One thing is certain regardless of what we all believe — the less inflammatory foods we can consume, the better off we are, and THAT is a fact. Inflammation can cause anything from weight gain to lowering your immune system (since 70 percent of our immune is in our gut) to heart disease to diabetes, arthritis, autoimmune diseases, and more. So what are some of the worst offenders? -First and foremost, as many of you may already know is hydrogenated oil. We need those out of the diet or at least kept to a minimum. But in addition, we also need to limit polyunsaturated vegetable oils like safflower, sunflower, corn, peanut and soy. They have a very high omega-6 content and very low omega-3 content and therefore, this imbalance encourages inflammation. A better choice is a good olive oil, for no to medium heat. For high heat, look to coconut oil, grass fed butter, or ghee. –Commercial or grain fed meat– There is a lot of controversy lately over eating meat or going vegetarian. I think most of the concerns you hear about regarding meat, is about the grain fed meat filled with omega-6s. Feedlot raised animals are fed a diet that is high in inflammatory omega-6 fatty acids but low in anti-inflammatory omega-3 fats. They are fed GMO grains like soy beans and corn. These animals are also, they given hormones to encourage growth and then the antibiotics, to prevent or recover from illness. That is a lot of things that our bodies don’t need. Instead (ideally) try to stick with grass fed meat, organic chicken, and wild fish. –Refined sugar– On top of the many reasons why sugar is not good for us, it is also reported that processed sugars and other high-glycemic starches increase inflammation, which causes physical pain, overheating, redness and swelling in addition to internal inflammation. The Dartmouth Medical School also found that sugar causes acne.. 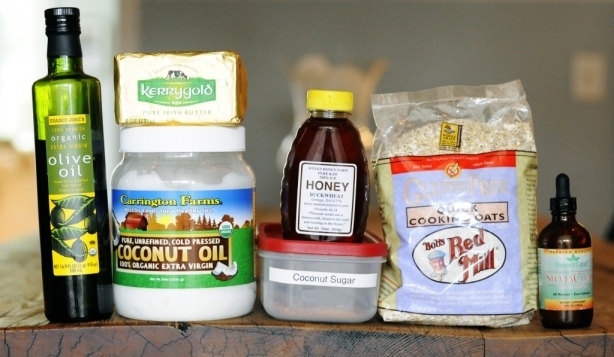 Try coconut palm sugar, sucanat (sugar cane), dark honey, pure maple (in limited quantities) or some stevia instead. –Processed grains are similar to refined sugar in that they have a higher glycemic index than unprocessed grains and can increase inflammation. In addition they are filled with gluten, which can damage our gut and cause inflammation because our bodies have such a hard time digesting it. Try to stick to grains like quinoa, millet, amaranth, gluten free oats, and brown rice. Click here to how to best prepare these grains. It is simple for the kids to comprehend and it really got my 5 year old’s attention. The kids asked questions and it gave me the opportunity to give my own examples while we were reading. Be sure to do the same so they fully understand and you can teach them what you believe in the process. I know, probably too many pics of my kids, and not really even good ones, but I needed some pictures for today’s post!